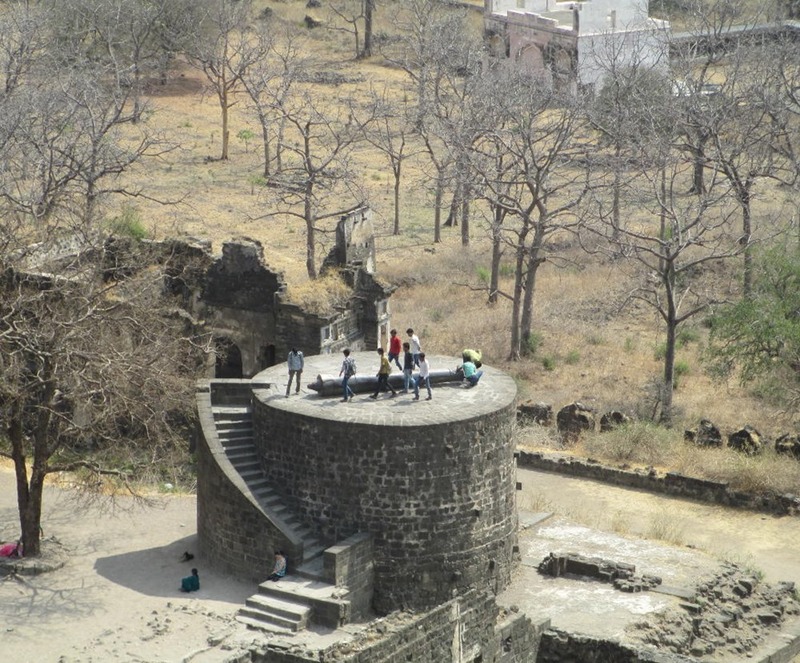 Now that I’ve got your attention, this weekend past, during a trip to see the sights around Aurangabad in Maharastra, we climbed up to the top of Daulatabad Fort (aka Devagiri or Deogiri). It’s a vigorous hike up 200 meters (656 feet) of uneven stone steps and steep ramps, winding through dark passages, up to spectacular views of the surrounding countryside. 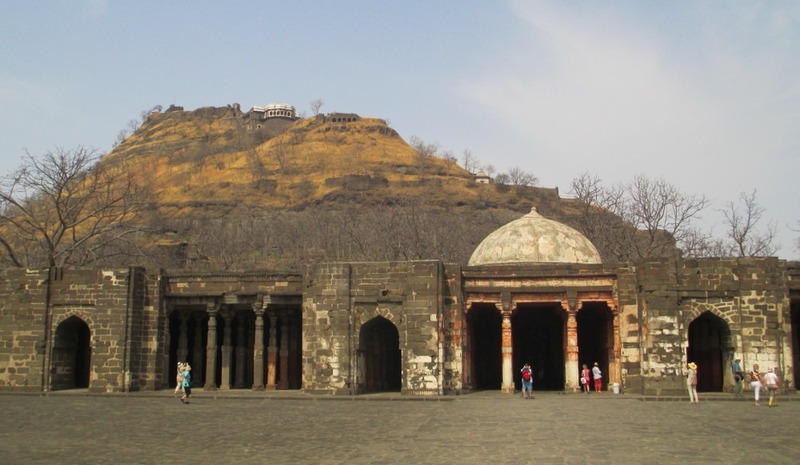 Daulatabad and its fort have a long history as a key military and economic stronghold, dating back to the late 1100s. 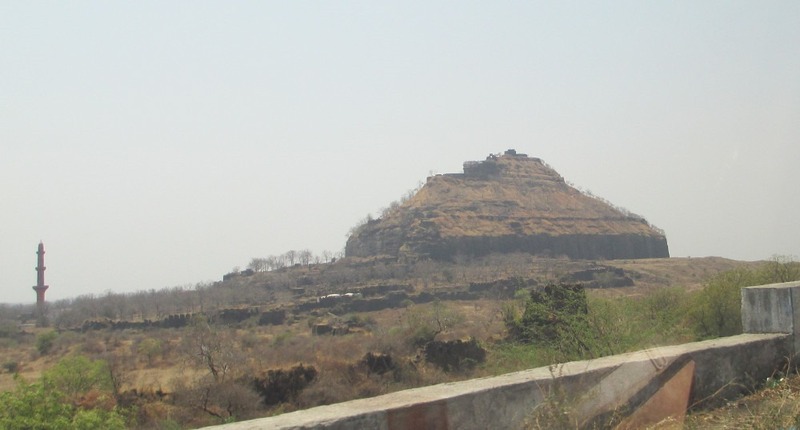 Devagiri was a fortress of the Hindu Yadava dynasty kings from the late 1100s before being seized by Moslem rulers around 1300, who saw its advantages as a military headquarters, and moved their capital to it in 1328. Water and resource shortages later led them to relocate back to Delhi. 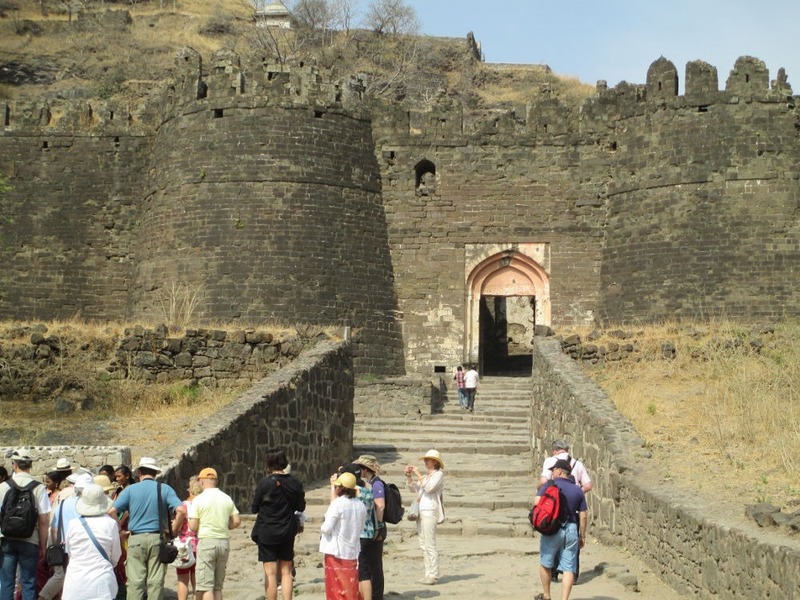 However it continued to be a center of power and contention for the next several hundred years, passing back and forth among various earlier Hindu, Mughal, Maratha, and later Maratha Peshwa rulers. 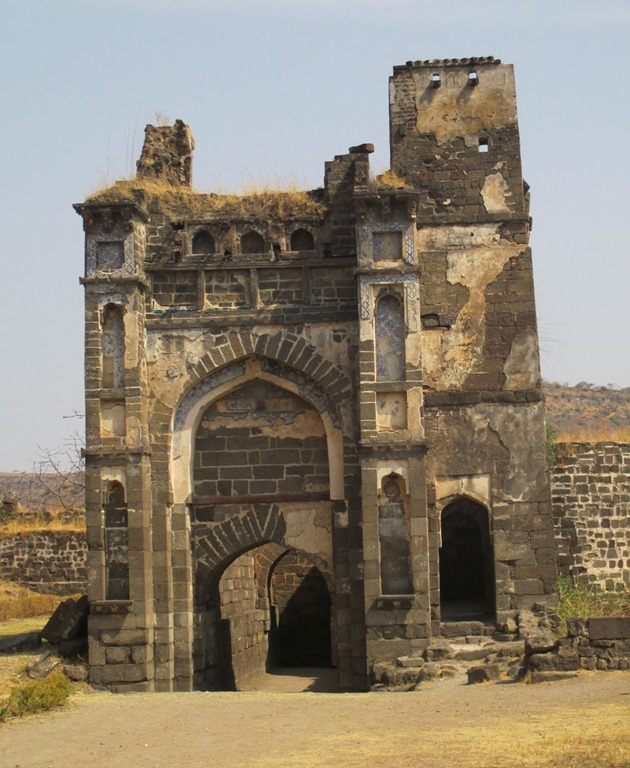 These struggles, alliances, and inter-ethnic détentes are the foundation of Maharashtra province’s cultural mix to this day. 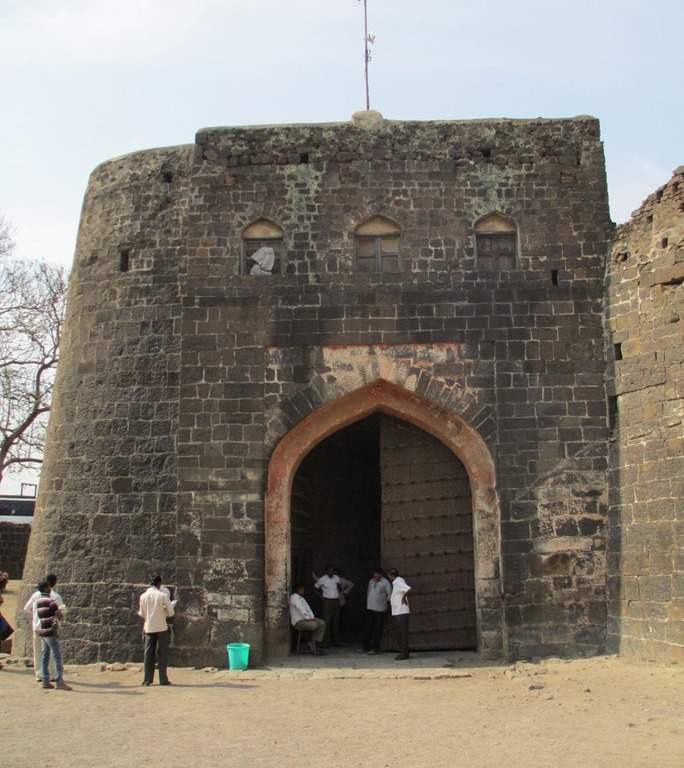 Devagiri’s defenses include many fortified gates, watchtowers, and multiple moats, one of which used to be spanned by a retractable leather bridge, traversable only on foot. 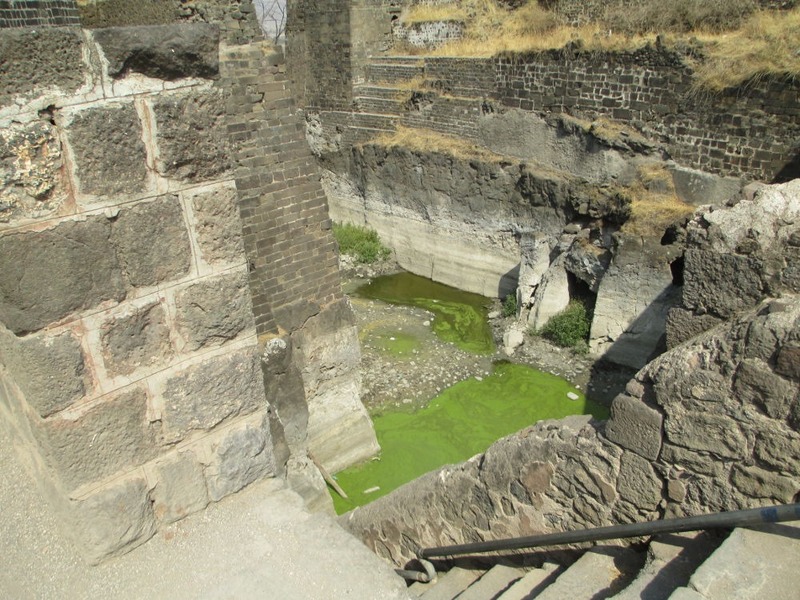 Today’s bridge is sturdy iron and wood, a good thing because the moat still retains water, green with algae in this drought. 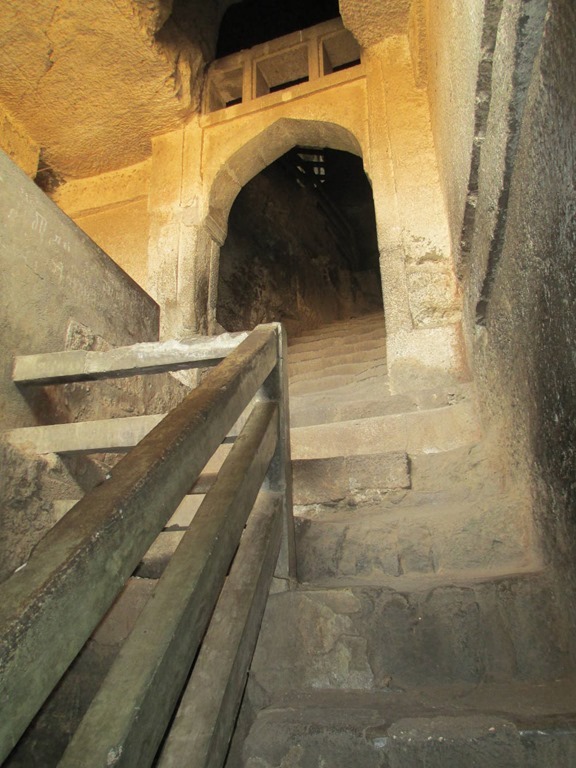 There is a twisty, steep and in places – a very dark passage on the main entry route, with deliberate drop-offs and false paths to lure invaders to their doom (thankfully roped off to protect clueless tourists). There are sluice gates through which rocks, scalding water or burning oil could be dropped on the unwary; archer holes, hidden sally ports, and cliffs hand cut and polished to make climbing impossible. Later defenses included gigantic brass cannon (as long as a van) mounted on towers. These are cleverly balanced on center pivots so they could batter besieging armies coming from any direction. 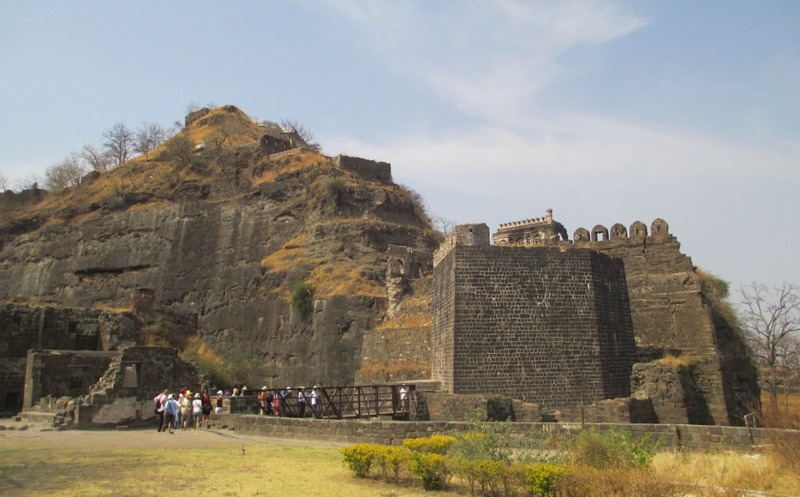 The ramparts are massive, cut into or assembled from the hard basalt stone of the region. 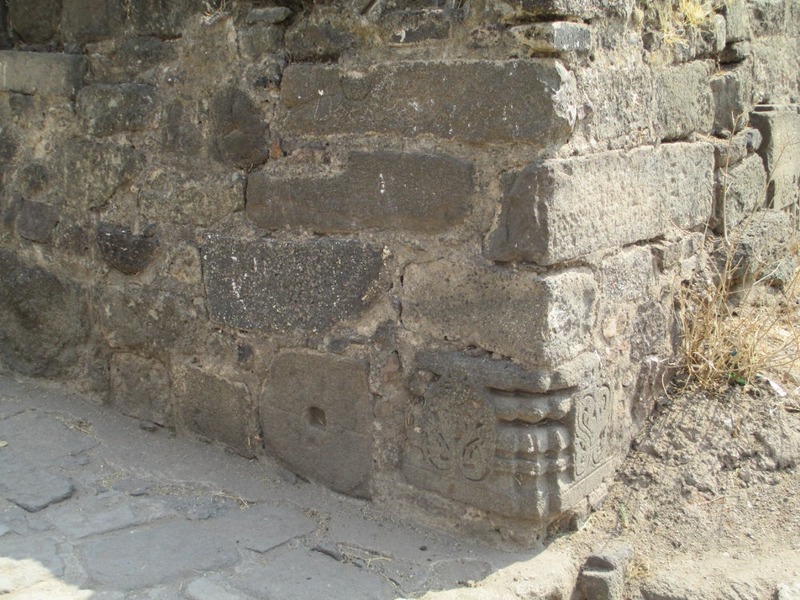 Building across the entire site clearly shows multiple periods of construction, ranging from the mighty initial citadel, to later Moghul palaces of graceful stonework, decorated with imported Chinese porcelain tiles and painted stucco. The fortifications are nested in winding layers, with gates widely offset to delay attackers, and to lead them past ambush points. 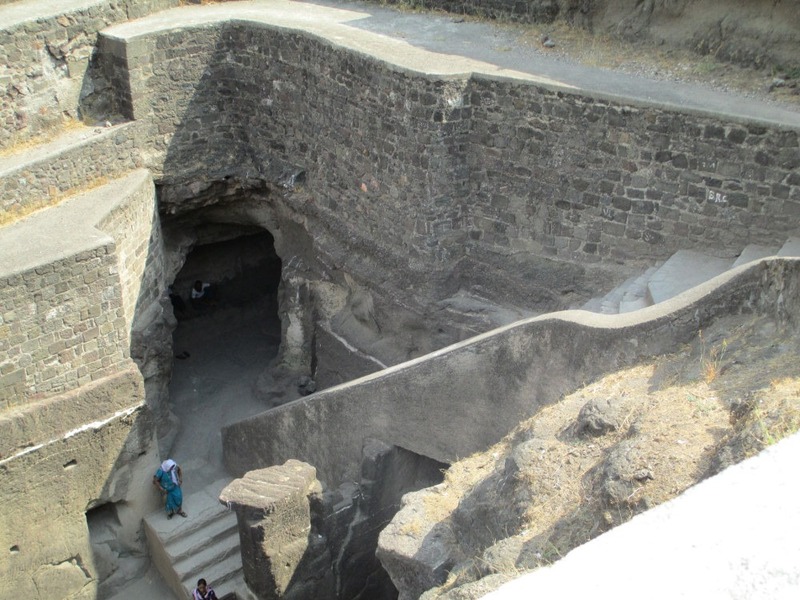 There are quarters, cisterns, and storehouses all the way to the summit. The lower circles of defense sport wide avenues that circle the hill, passing through defiles that could shelter large numbers of defenders ready to pounce on any incoming troops. Many of the towers, shrines, palaces, and walls (with the exception of a later brick-red minaret) were once covered with white stucco, and must have been an imposing presence, a multi-tiered, gleaming set of ramparts on top of the hill’s sheer, black, hand-chiseled cliffs. Of course there are many differences, too. Tolkien describes a much larger city, with more circles of defense, and an entire population living inside. 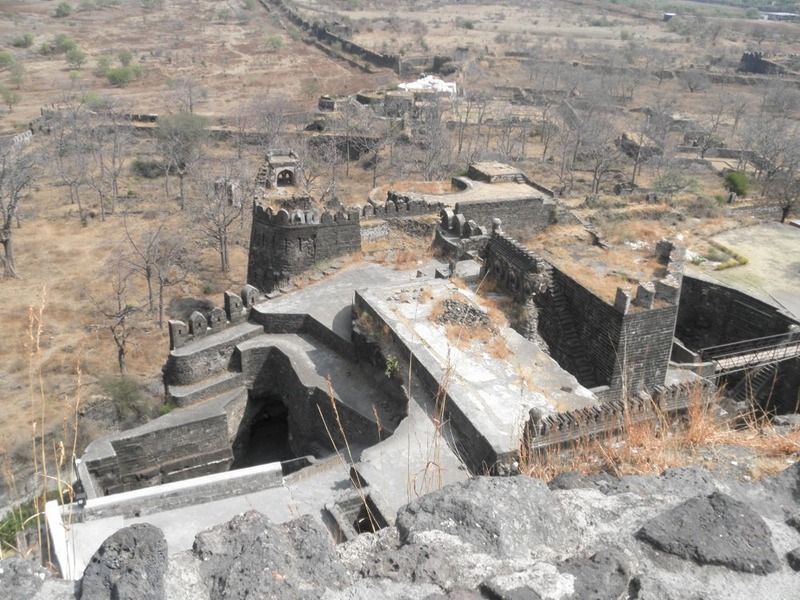 There was a town to support Devagiri, inside the outermost circle of fortifications, but it was arrayed at the base of the hill, rather than on the hill itself. 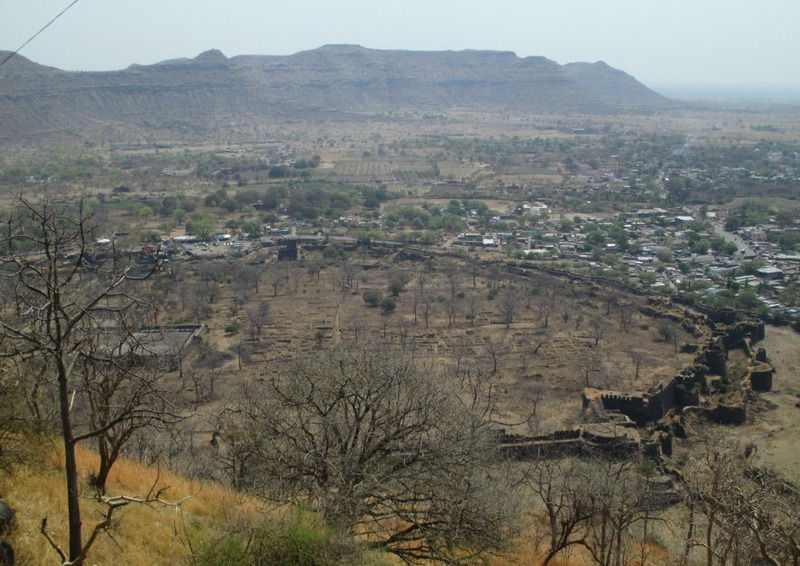 Dautalabad itself is far inland, up on the Deccan Plateau – on an arid high plain punctuated with other hills of similar configuration. There is no navigable river or port for ships, be they from Dol Amroth or Umbar. And while there are far-outer rings of defense enclosing what may have been support lands for agriculture or fodder-lands for war horses and elephants, there is no great wall of Rammas Echor enclosing a Pelennor-sized expanse before the gate. No longer the contended redoubt of fierce warrior poets, today Devagiri is the slowly crumbling home of tour guides, elderly temple wardens, souvenir hawkers, gray langur monkeys, stray dogs, and clouds of bats. 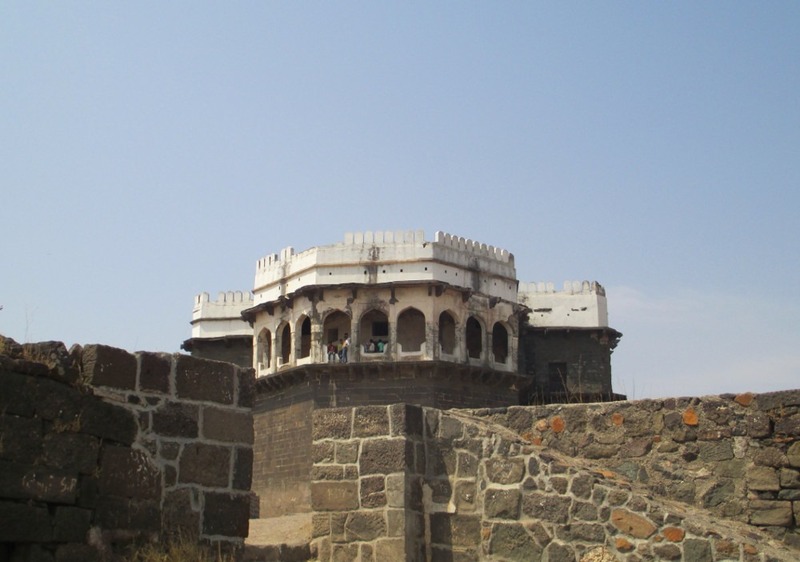 Romance and idle speculation aside, visiting the fort has taught me much about the area’s history and onion-like culture, with layers of influences laid one on top of the other. I marvel at the scope of effort and breadth of power a monument of this size still represents. Fascinating! I tend to be very aware of the European fodder (I nearly said Ind-European, which would have been a mistake in this case!) for Tolkein’s masterpiece; but of course you are right – he would have had idea access to a considerable amount of material from Britain’s colonial holdings as well.